When I moved this blog to WordPress some posts did not survive, so in an effort to move some of my favorite posts with me, I will be republishing them here. This post first appeared in May, 2011 and continues to be one of my most read. Teach them how to blog first. We did an excellent paper blogging lesson first (found on the blog of McTeach), which brought up why we were blogging and how to do it appropriately. This got the students excited, interested as well as got them thinking about what great comments look and sound like. Talk safety! We assume some students know how to be safe, but don’t assume it; teach them the do’s and dont’s. I came up with the lesson of why the Internet is like the mall and it really worked. I also sent home safety plans for students and parents to discuss and we discussed it throughout the year. Teach them how to comment. In order for blogging to be effective, comments are needed, but if students don’t know how to properly comment they will lose out on part of the experience. We discuss how to thank people, how to answer their questions, and most importantly, how to ask questions back. This is all part of common conversational knowledge that all kids should be taught any way. Start small. The first post was an introduction of themselves. It was an easy topic and something they really liked to do. They then got to comment on each others post as well which started to build community. Include parents. Parents always know what we are doing and are invited to comment. The students loved the extra connection and parents loved seeing what the kids were doing. Connect with one or two classes to be buddies. While comments from around the world are phenomenal, the connections are what it is all about. So reach out on Twitter or through the most excellent #comments4kids and set up something more permanent. The students relish getting to know one another and the comments become even more worthwhile. Thanks Mr. Gary’s class in Egypt and Mr. Reuter’s 6th grade class in Merton, Wisconsin for being our buddies. Speaking of #comments4kids, this excellent site created by Will Chamberlain is a must for anyone blogging with students. Link their blog to it and ask people to comment, tweet it out with the hashtag #comments4kids, and use it to find classes to comment on. Visit other classroom blogs. Show them how other kids use it and have it inspire them. Blogs can be found through Twitter or the comments4kids site. Let them explore. My students love to play around with font, color, and images. They taught each other how to do anything fancy and also let each other know when font or color choices were poor. This was a way for students to come into their own as creative writers and also start to think about creating their online identity. Don’t grade! Blogging is meant to be a way to practice writing for an audience and learning to respond to critique, not a graded paper. I would often tell students my requirements and even make them go back and edit but I never ever chastised them for mistakes made. Challenge them. Often students would ask to write about topics but we also had a blogging challenge almost weekly. This was my way of finding out what they really thought about fourth grade, their dreams, their hopes and their lives. The kids always wondered what the next challenge would be and looked forward to writing them. We would also share creative writing pieces from class, create diaries of work we did, and share our op.ed. pieces. Map the connections. We have a world map in our classroom that we use to push pin people we connect with, it is amazing to see it grow and what a geography lesson is has turned out to be. 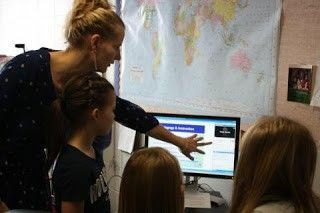 Students are acutely aware of where Egypt, Alabama, New York and other places in the news are because they have connected with people there. Give it time! Some students took to it right away, others weren’t so sure, and yet they all ended up loving it. The sheer mass of paper I have had to print to create their writing portfolio is staggering and it shows how ingrained it became in our classroom. I now have kids blogging when they are sick, out of school or just because. So here it is, take the leap and believe in your students’ ability to stay safe and appropriate on the internet. Stay tuned for a student-created video tutorial on how to use Kidblog, kids teaching kids, that is learning worth doing. To see our student blogs and maybe even leave a comment, please go here.